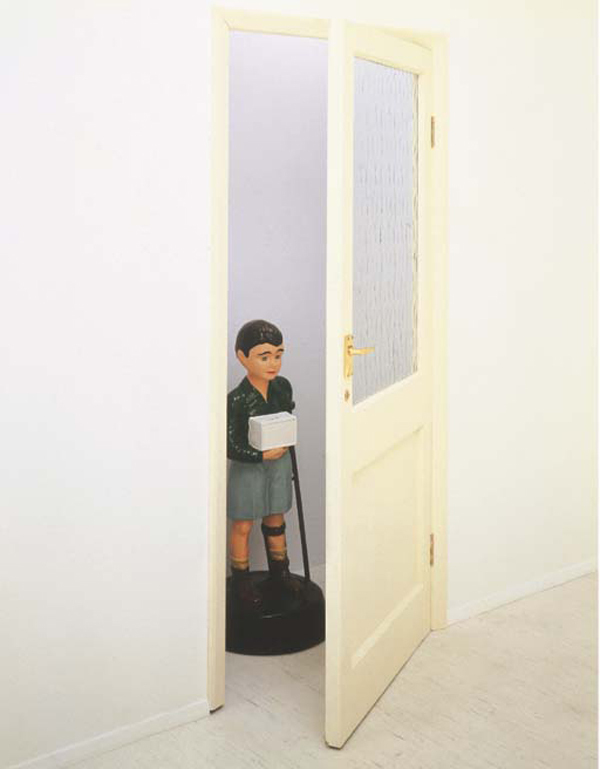 The two works of Stewart’s that have stayed with me with real clarity and which made me think of her again now – a thought brought on by someone mentioning Damien Hirst’s Charity (2003) – are the works Untitled (Pregnant Schoolgirl) and The Boy from the Chemist is Here to See You which both recall the donation boxes used by SCOPE – then the Spastics Society – in my childhood (surprisingly the boxes, which were usually found outside chemists’ shops, weren’t phased out until towards the end of the 1980s). In the latter work, one of the boxes seems to have decided to come to visit and is waiting at the door, as though he wants us to come out to play. Though putting a coin in one of the these boxes was probably the first experience of charitable giving for many children of the ’50s, ’60s and ’70s (I still can’t quite get my head round the idea that they were still out and about in the 1980s, even though the internet says it’s true), we’d have run a mile if one of them had wanted to make friends with us. Though on one level they drew attention to disability in a manner that was presumably aimed at saying we’re all just people rather than just at raising money, in fact they marked disabled children out as other in a way that must surely have been counterproductive. 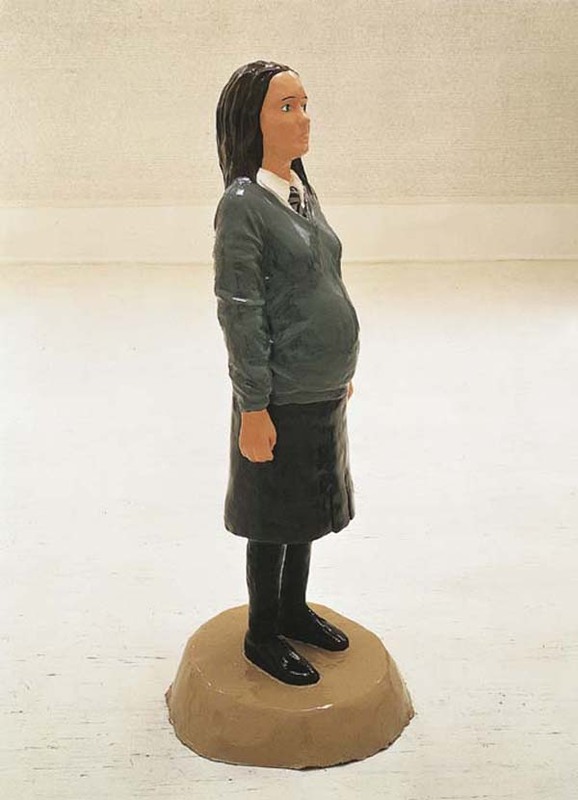 Stewart’s pregnant schoolgirl carries all the hallmarks of the charity box children, apart from the leg brace or crutches that were usually the preferred signs of disability. She stands straight and shiny on the same lumpy base as if waiting for our donation. Given her lack of a collection box, had she been one of the Spastics Society’s boxes, we’d probably have put the coin in the top of her head; but of course this begs the question about whether we would have been willing to give. The upright posture and the base that prevents others from getting close gives the feeling that the girl is now cut off from her peers; the school uniform marks her out as a child in an adult world she can’t yet fully understand. Though she still wears the uniform, she is no longer hanging out with friends in the playground. 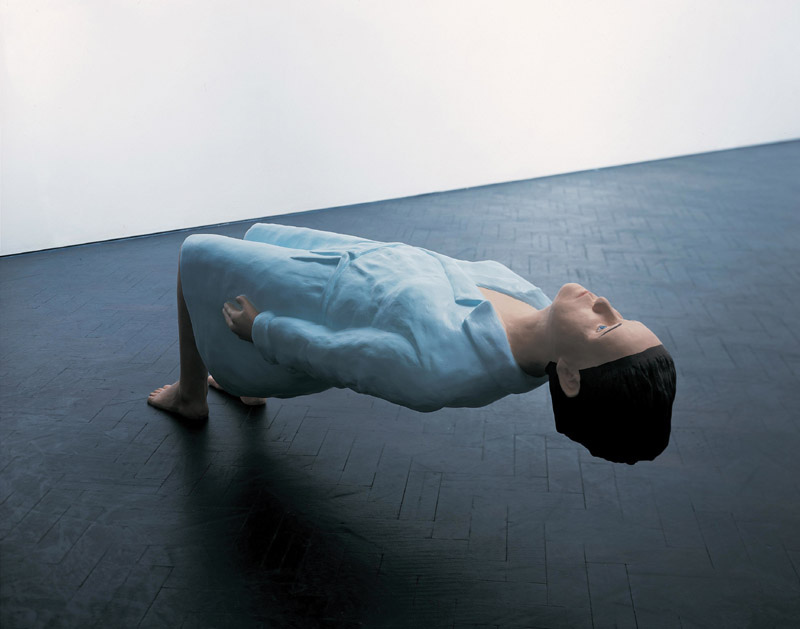 This entry was posted in Identity, Installation, Sculpture and tagged art, Ghost, installation, Kerry Stewart, Pregnant Schoolgirl, sculpture, The Boy from the Chemist is Here to See You, This Girl Bends by Ann Jones. Bookmark the permalink.